“Visual literacy is a set of abilities that enables an individual to effectively find, interpret, evaluate, use, and create images and visual media.” We are a visual culture; we find it easy to explain a story using pictures and illustrations rather than words. “A picture is worth a thousand words” is a saying that is very prominent in our society. Visual literacy takes this one step further, by adding interaction and stories behind a set of data to learn how something works, or how things are connected. 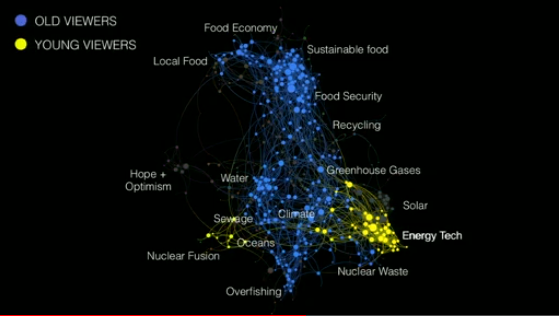 In the two examples I have found, the visualizations show how people are connected by ideas, and Netflix views. The first example is a TED talk done by Eric Berlow and Sean Gourley entitled “Mapping Ideas Worth Spreading.” In the presentation, they map out all of the TED talks done, arranged by broad topics such as video games or environment. 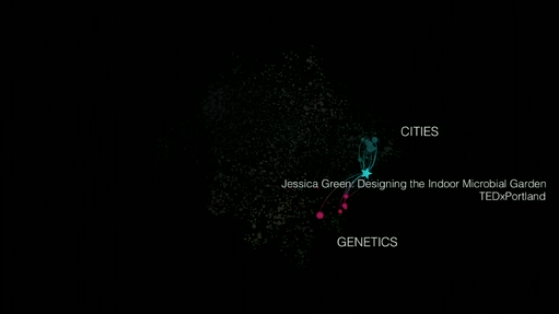 Each talk is represented by a dot that is connected to others if their topics are similar. Under each broad topic lie even more specific topics for example, under the umbrella of environment there are exclusive topics such as nuclear waste and greenhouse gases. Each of these talks are unique, yet their topics can easily be connected to others. 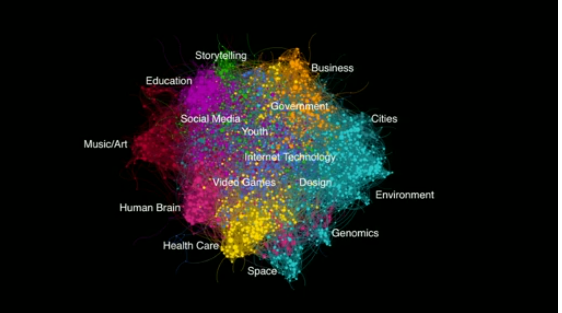 Berlow and Gourley deicide to dive deeper into the visualization, categorizing the talks by the viewing audience. They split the viewership into older and younger demographics, seeing which topics are more interesting to the respective audiences. The younger viewers were more interested in topics such as energy technology and nuclear fusion while the older viewers were spread out over the spectrum. Berlow and Gourley then changed the categorization to male and female viewers. The males seemed to be more interested in solar energy and females were drawn to food economy. These different categorizations tell their own stories. It makes sense as to why younger audiences would be interested in energy technology as opposed to their older counterparts. Younger viewers would be more attentive to the technological aspect of the environment because they grew up with technology, therefore they would understand it easily. Each talk is created by a different speaker, but may have the same underlying message as a completely different talk. One talk on social media might have ties not only to youth, but also to education while another relates social media to government elections. Similar, but different. Berlow and Gourley point this out later in the video. They take two very different topics, genetics and cities, and find the talk, entitled “Designing the Indoor Microbial Garden,” that connects the two. This is so remarkable to me that two topics that are at differing ends of the spectrum can easily be connected. I might just go back and watch that talk, since it has piqued my interest. Berlow and Gourley go on to explain that here are some talks that didn’t fall into any category, that they are their own entity on the visualization, for example, the talk entitled “Living Sea Sculptures.” So there are still the few individuals in the realm of TED talks, but they may soon have company. Maybe one day, a plethora of talks will surface and Living Sea Sculptures will become it’s own major topic. By using an image to show what they are talking about, Berlow and Gourley make sure that the viewers of their presentation know what they are talking about. If they stood in front of their audience and just regurgitated the information back at us without showing us what they were talking about, us as the viewers would have a harder time understanding them. With the color-coded and animated diagram to illustrate the points they are making, Berlow and Gourley make their presentation fun to watch, as well as to listen to. 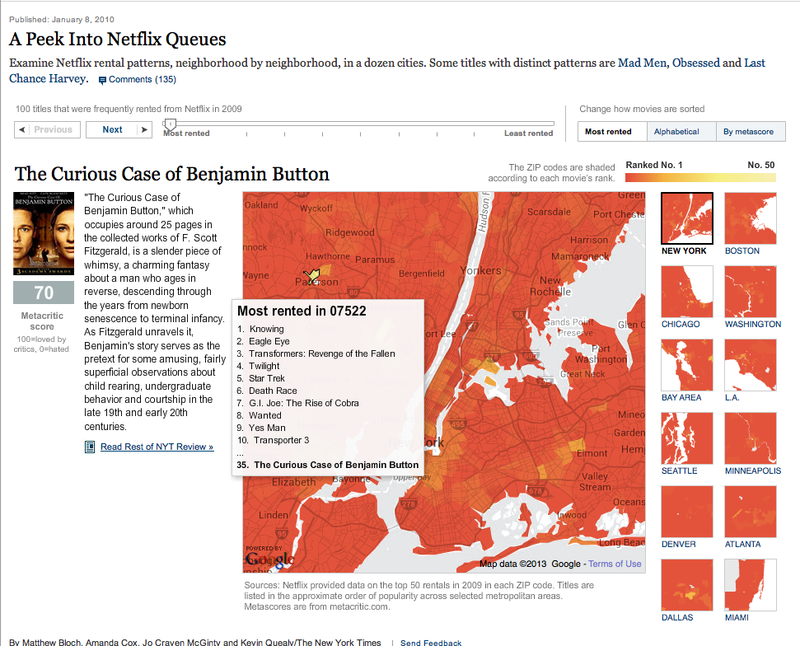 The second example of visual literacy is a map done by a group of reporters from the New York Times. 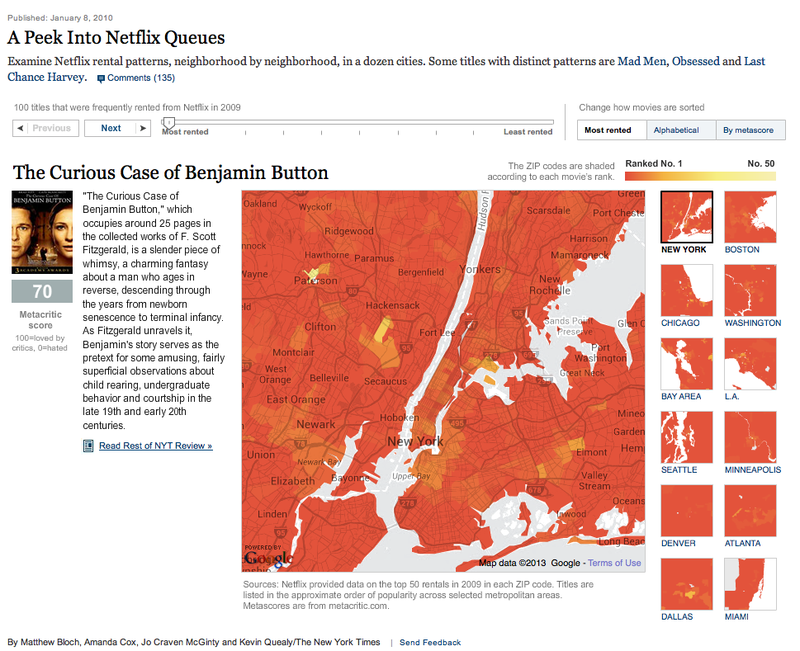 This map, entitled “A Peek into Netflix Queues,” examines Netflix rental patterns. It shows what residences of major cities across the country, divided by zip code, rented most from Netflix in 2009. There are multiple ways to manipulate the map; by city or by movie. You can chose a movie and see which neighborhoods rented it and how popular it is in certain cities. You can also change how the movies are sorted; by most rented, alphabetical, or by metascore. Changing how the data is sorted surprised me. The greatest reviewed movie was Wall-E and it was in only a few neighborhood’s top 10 and the most rented movie, The Curious Case of Benjamin Button, did not score high with critics. Also, many movies hated by critics, such as Eagle Eye and Paul Blart: Mall Cop, were high on many neighborhood’s rental lists. This data is very telling of not only the critics but also the viewers. Many viewers may not take into account the score critics gave a movie. I know I personally disregard reviews if I am really looking forward to a movie and critics rip it to shreds. Also, many of the most rented movies starred high-profile actors and actresses such as Brad Pitt, Will Smith, and Clint Eastwood. People may have been drawn to these movies just because of the star-power behind them. However, there are a few neighborhoods that differ from the others. A few zip codes in New York, Dallas, and Los Angeles didn’t even have The Curious Case of Benjamin Button in their top ten; some didn’t even have it in their top 50. Unfortunately, in some cases that horrible “vampire” movie Twilight was the most rented movie. To each his own, I guess. Something that I would be interested in seeing done with this map is the choice to choose between either movies or television series that were streamed. Many people today binge watch series, but what is the most popular? Is it one that has been on television for years like Grey’s Anatomy or Netflix exclusive series like Orange is the New Black? The fact that I can interact with this map is very important. Without the interaction the map would be extremely cluttered and hard to read. Much of the information that is displayed by mousing over the areas would have to be written out underneath or to the side of the maps. 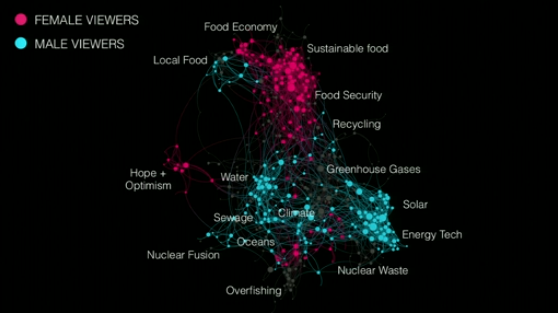 These two visualizations are perfect examples of how people are connected, either through ideas or culture. Adding interaction and explanation to them only enhances the actual image to create something that all can understand. If a picture is worth a thousand words, then maybe a visualization is worth ten thousand.